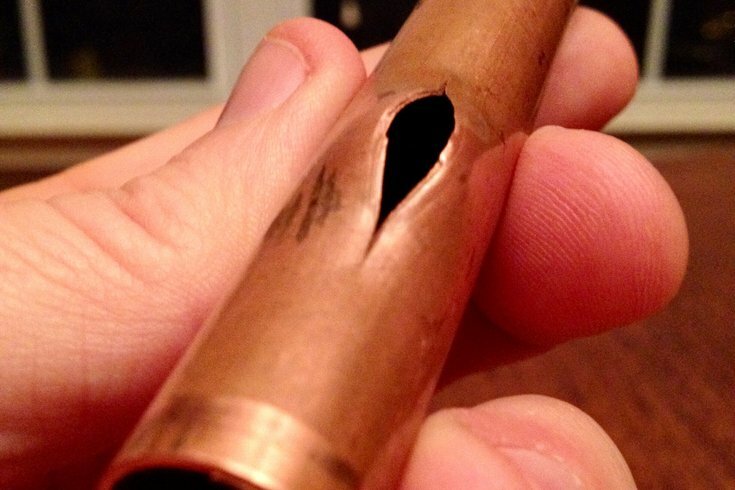 A relatively small crack in a copper water pipe, like this one, can flood a home with hundreds of gallons of water in a relatively short time. This crack is the result of the pipe being poorly insulated. The calls start coming anytime the temperature drops into the low 20s and remains that cold for more than 48 hours. One frustrated homeowner after another dials up Joseph Giannone Plumbing, Heating and Air Conditioning in Folcroft, Delaware County, looking for someone to repair a busted pipe. "We've pretty much been at that temperature for more than 48 hours at this point," said Joseph Giannone, 31, a fourth-generation plumber. "We started to get some frozen pipe calls yesterday, and we'll probably get some more today." In many cases, these icy situations can be prevented. With temperatures in the Philadelphia region expected to stay at or below freezing for more than a week, Giannone provided some tips aimed at helping homeowners avoid frozen pipes – and the costs that go with repairing them and the damage they can cause. "An ounce of prevention can go a long way," Giannone said. Most frozen pipes occur in unfinished basements or behind poorly-insulated, exterior walls running from floor to floor. Giannone also finds frozen pipes in homes where bathrooms are built over unconditioned spaces, like on balconies or above breezeways. Giannone offered a simple tip to prevent those pipes from freezing – space heaters. "That's a cheap and easy fix," Giannone said. "A lot of people think you can go into pipes and things like that. It's really not worth it because you're going to have to rip apart walls." Placing a space heater or two in the basement goes a long way toward keeping any poorly-insulated pipes from bursting. The heat will migrate and act as an insulation barrier. Even if a homeowner has to keep the space heaters running consistently for several days – as homeowners in the Philadelphia region might need to do as the calendar moves into the new year – Giannone said the bit of prevention will prove more cost-effective than ripping apart walls to insulate pipes. "It doesnt really pay, either," Giannone said. "The space heater is probably your best bet." If necessary, a homeowner can wait until later to pay to install a duct vent. 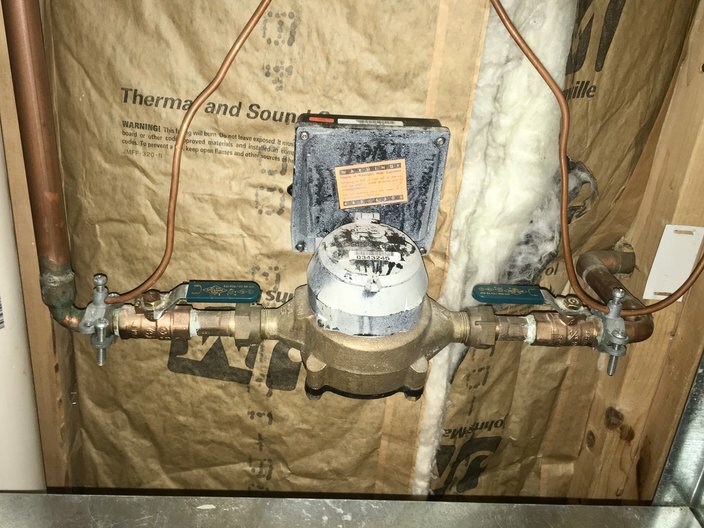 And for attics – another common place to find frozen pipes – Giannone recommended installing heat trace tape on the pipes. Homeowners trying to reduce their heating costs often keep their thermostats set to lower temperatures – particularly at times when they're not home. But those savings can easily be washed out by a frozen pipe. Giannone warned against setting the temperatures lower than 65 degrees on the coldest winter days, especially if the homeowner is unsure how well the pipes are insulated. "A lot of people like to go down to 55 degrees," Giannone said. "I'd recommend keeping it at 65 degrees. I don't recommend dropping it down to 55 during the day. If they're unsure of what their house is made of, just leave it at a low of 65 during a 24-hour period at this time of the year." By code, the lowest temperature a thermostat can be set is 55 degrees, Giannone said. Thermostat manufacturers "do that because of freezing temperatures," he said. "They don't want pipes to freeze." Each fall, homeowners should get their heating system checked out by a heating professional. Giannone likened the inspection to a family embarking on a summer road trip across the country. The family makes sure the car is running without any issues before hitting the road. "It's the same thing with your heating system," Giannone said. "Once the heat goes out, the reality is that everyone is going to be calling. People may think their situation is unique. In reality there's a lot of other people in a similar situation." And then the homeowner ends up frustrated when they're placed at the bottom of a lengthy list of repair jobs. With some proactive maintenance, the worst-case scenarios can be avoided, Giannone said. He recommended homeowners call an HVAC contractor each September. "We offer heating system inspections at about $59," Giannone said. "It goes up from there as the season goes on. That's what we do." One of the surest signs of a frozen pipe occurs when a person flips on the faucet but water does not come out. In that unfortunate scenario, Giannone said the homeowner should turn off the main water valve, typically located on a wall in the basement. "Turn off that main valve," Giannone said. "Drain all the faucets inside the home and everything. That way it drains down the whole house. That's what I would recommend." Doing so could mitigate the water damage that often accompanies burst pipes. When the pipes warm – and the ice thaws – the water will seep through the cracks in the pipe. "The water is in the line already," Giannone said. "As it freezes, the ice expands. What happens is it expands so much that it cracks the copper lines." When calling a plumber, Giannone said, homeowners should remember that at this time of year most plumbers already have a lengthy list of customers with similar problems. Insurance companies get backed up with claims too, because most will not pay for repairs without first sending an adjuster to inspect the damage. As a result, geting the pipes fixed can take some time, potentially leaving a portion of a person's house unusable. That's why Giannone stresses being proactive and taking preventative steps so homeowners can save themselves headaches and a whole lot of money.